Dr. Robert Thacker sharing his love of science with an engaged crowd. Dr. Robert Thacker, Director of the Science Outreach Centre and Professor in the Department of Astronomy & Physics at Saint Mary’s University, is the 2018 recipient of the Canadian Astronomical Society’s (CASCA) Qilak Award for Astronomy Communications, Public Education, and Outreach. The Qilak Award honours Canadian residents who have made an outstanding contribution either to the public understanding and appreciation of astronomy or informal astronomy education in Canada. In addition to maintaining an internationally recognized research portfolio, Dr. Thacker dedicates his time to science outreach. 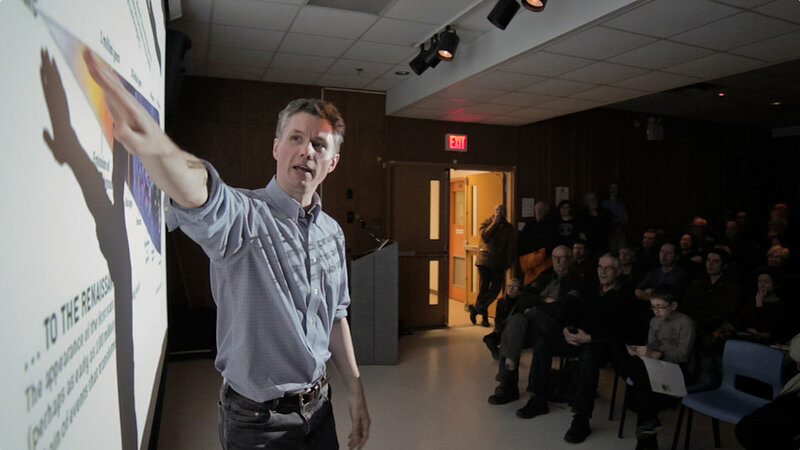 Since 2009, he has given 68 public lectures and has participated in over 350 media interviews and sciences programs, including a weekly segment on CBC Radio’s Mainstreet NS and 1310 News’s Ottawa Today. In recognition of his commitment to science outreach in Atlantic Canada, he was named Science Champion at the 13th Annual Discovery Award in 2015. Dr. Thacker also maintains an active online presence; find him on Twitter @DrRob_Thacker or visit the Sounds of Science podcast page.